In the early 1850s, Eleanor Solomons moved from South Carolina, to Savannah, Georgia, to join her son Lizar and his wife Perla, who were living near another son, pharmacist Abraham Alexander Solomons. On the occasion of this move, Eleanor’s younger sister Charlotte Joseph orchestrated the making of an album quilt. Family and friends, women and girls, Jews and gentiles, sewed 63 blocks, which were then pieced together. 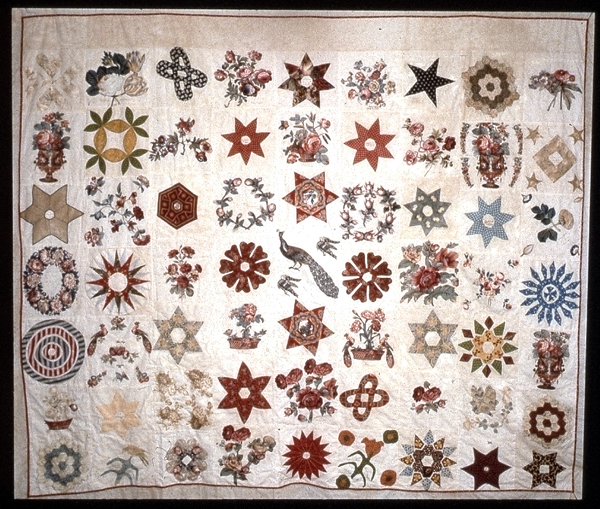 Like an album of photographs or autographs, the quilt would serve as a remembrance of distant friends. Inscriptions, inked in black by Eleanor, identify the makers of the blocks. Most of the sewers lived in South Carolina or Georgia, but cousins as far away as New York also contributed their needlework. 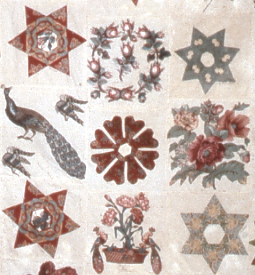 The center block, with peacock and eagles, is signed by “C,” perhaps Charlotte Joseph. Rebecca Moses and two of her daughters each donated a piece. Eleanor’s six-year-old granddaughter Cecilia Solomons, daughter of Lizar and Perla, made one block. The black woman who nursed Eleanor’s children sewed another. Inscribed by Eleanor, “My servant Rinah,” the seven-pointed blue-green calico star testifies to the bonds of affection and servitude that at times coexisted in the antebellum South.